You've seen it happen repeatedly. Forecasters have a tough forecast ahead of them. But how are they supposed to know which model data will be the best one to help them come to a conclusion about the situation? In situations like this, the first step should always be to assess the model data against a set of current observations that should show a 1-to-1 relationship with the model output. Which variable should be plotted? On which surface? Which current observations will make the most sense to assess against? If you know the answers to some, but not all of these questions, find these answers and more by going through this lesson. This lesson reinforced some good concepts about model initialization, and I found it particularly interesting learning how water vapor imagery specifically can be so instrumental in seeing how well a model initialized; however, the examples used in the lesson, in my opinion, were not as concrete and black and white as the presenter claimed, making it difficult to arrive at the same conclusion about whether to modify data or not, and if so, how. Good lesson in concept - not as great in practical application. Interesting module. Quite an advanced course which is best tailored to meteorology personnel that have the opportunity to directly modify NWP initial condition data in the model's assimilation chain or/and have access to synthetic WV imagery in their forecasting office. Some of the differences between WV, PV and SWV was not always that clear to pick out since some of the PV isolines sometimes obscured the WV imagery underneath and subjective interpretations sometimes differ. Forecast challenge 2, question 13 had no satellite imagery. I therefore used satellite imagery from question 12 but analysis locations b and c were not highlighted on this imagery. That being said, quite instructive module which introduces one to synthetic WV imagery (analogous to model simulated radar reflectivity as a proxy to radar) and when or when not to trust model PV/SWV fields when compared to WV imagery. Critique different variables on their effectiveness for comparison to water vapour imagery for assessment of numerical weather prediction (model) output. 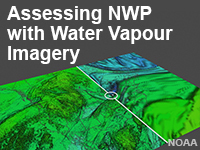 List the best numerical weather prediction (model) variable to compare to water vapour imagery. Classify water vapour/numerical weather prediction (model) comparisons based on their match/mismatch in certain areas between water vapour imagery, potential vorticity surface, and synthetic water vapour imagery. State what can be done different forecast situations with the numerical weather prediction (model) fields. Adjust a numerical weather prediction (model) forecast based on assessment against water vapour imagery.